LOUDON, Tenn., March 08, 2019 (GLOBE NEWSWIRE) -- Malibu Boats™, the global leader in towboat sales was recently represented by CEO Jack Springer and VP of Sales and Marketing Eric Bondy. The show was hosted by business mogul and one-time model Kathy Ireland and involved an overview of Malibu’s history and future with the savvy businesswoman, who herself helms a $2.5 billion retail licensing empire. The 30-minute show will air on Fox Business and Bloomberg International. 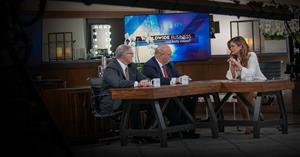 Malibu Boats CEO Jack Springer and VP of Sales & Marketing Eric Bondy on Worldwide Business with Kathy Ireland. Talking scale, Ireland was impressed to hear Malibu was started by six friends with a passion for watersports and is now the volume leader in the towboat segment. She will also review the Cobalt and Pursuit brands and their product offering. The full interview, including Ireland being wowed by a brand-new Malibu Wakesetter 25 LSV, will air on Fox Business Network on Sunday, March 10, 2019 at 5:30pm ET and Bloomberg International on Saturday, March 9, 2019 at 7:30pm GMT and Sunday, March 10, 2019 at 10:30am D.F. and 3:00pm HKT.